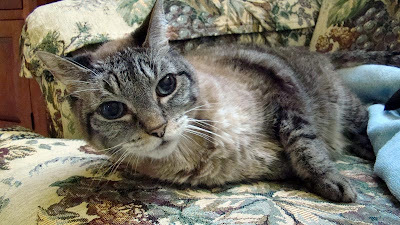 It's a beautiful, sunny day in Grayslake, and Gato hopped into the chair to make the most of it. She'd doing better lately and no longer howling in the morning. Stanley is doing well too. He's even using the litter pan more often. I think Stanley never really felt secure enough to use one while Patrick was around. He preferred to sneak down into the basement instead. We took a drive into Wisconsin in the bus this morning, but didn't take Gato with us. I don't think she cared very much. It was a nice morning to nap in the sun. Last night, Patrick's vet came by to put an end to his suffering. It was quick and I hope it was painless. We tried everything we could to help him over the last month, but it wasn't enough. It would have been cruel to allow him to suffer for our own selfish reasons. It's very quiet here now. No more sock moving at night. No more 4am wake up calls for breakfast. No more licks on the nose and face. No more poop on the floor. I've lost my little boy and my loyal friend. It feels like someone has punched me in the stomach. I know things will get better, but it will take time. We have spent most of the day sitting with Patrick. Actually, he came out this morning and sat near us. He napped in the sun and stretched out near us. He still isn’t eating, but I am glad he didn’t spend the day in the dark closet. Gato and Stanley spent some time with us as well. He seemed to perk up after he received the sub-q fluids this morning. We also cleaned him up so he wasn’t wet. I am sure that made him feel a little better. We called our new vet earlier today and she will be coming by the house tomorrow evening. I’m having a hard time keeping my emotions under control, but I’m trying not to appear upset when I’m near Patrick. He seems calm today and I do not want to disturb him. I want his final days to be as quiet and peaceful as possible. Patrick has moved to a closet and he is hiding in a dark corner. He hasn't been hiding like this in over a week. The poor boy hasn't had anything to eat on his own in about three days. Over the weekend I felt he was about to make a turn, but I didn't expect it to be in this direction. Patrick is downstairs, sleeping near me as I write this. He had a big day with family staying with us over the weekend. Patrick spent most of his day on a heating pad, with Gato nearby. Unfortunately, he hasn’t had much to eat today. He didn’t sleep with us last night and I bet he would stay downstairs tonight if I were to let him. I’ll probably have to carry him back upstairs to bed tonight. Earlier in the week, Patrick began peeing where he sat. We thought he was getting weak and losing control of his bladder. Our home vet determined it was a bladder infection and prescribed antibiotics. After a couple days on the antibiotics, Patrick stopped having accidents. We wonder if the medicine is upsetting his stomach and keeping him from eating. I am disappointed the prescription that the animal pharmacy provided was bubblegum flavored liquids for the antibiotics. I can’t believe there isn’t some other cat friendly flavor. Patrick takes the twice a day dose better than we expected. In fact, he has been the best patient for his daily sub-q fluids. He stays on his side without putting up much of a fight. The boy even kissed me on the nose a couple times while we held him still. So much for the “Caution” warning, he came with. Gato and Stanley have been very kind to Patrick lately. No one has tried to take advantage of his weakness. I'm very proud of them. I don't think the three cats have ever spent this much time sitting near each other without fighting. Until last night, they had even been sleeping near each other in bed. I don't think has ever happened before. They are certainly watching over their big brother. Patrick is still with us. Our vet just left, but we did not go through as planned. Once the time came, we just could not agree on the decision. One of us wasn’t ready and this has to be a decision we all agree on. We will take a week to see how Patrick does. He has been giving us mixed signals since Sunday. On one hand, he has lost control of his bladder and he is very wobbly on his feet. On the other hand, he seems much more alert and his appetite has greatly improved. He's spent the last two nights sleeping in bed with us. Patrick is also trying to clean himself, which we haven’t seen him do in a long time. The vet didn’t think he was in pain and said it wouldn’t be wrong to wait a little longer. She also made it clear that we need to be realistic and not expect a miracle. We will continue with his IV and medication. He will be confined to the bedroom, so he doesn't fall down the stairs. We are also going to get a urine sample, to see if he has an infection that is causing his incontinence. I hope we haven’t made a selfish decision that will cause him to suffer later. I am very confused right now and emotionally drained. Today we made one of the hardest decisions we've had to make in a long time, the decision to help Patrick cross the Rainbow Bridge. He is still here with us, but he has told us in his own way, that it is the right time. Our new vet will be making a house call to see him tomorrow morning. He may have had another stroke on Sunday. We awoke to find him missing again, only this time he wasn’t waiting for breakfast. He was hiding under some furniture, near one of his old favorite napping spots. He can barely walk lately, but all of a sudden, he now has an urge to get into bed with us. He spent last night in bed. That was the first time he has done that in over a month. It gives me false hope for something I know in my heart will not happen. He is not going to return to be the big, alpha cat that has lived with us for the last nine years. I have to accept it. I have to continue to remind myself that he needs us to do what is best for him. I have become very selfish and want to keep him around for as long as I can, but I know he isn’t happy. He is a strong cat and I want him to keep his dignity. It is my responsibility to make sure he doesn’t lose it. If nothing else, I owe him that. I love you so much Patrick. I hope that I am not a coward tomorrow. Our regular vet diagnosed Patrick with Anemia last week. 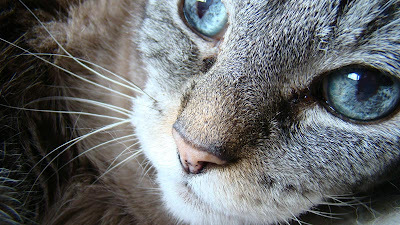 It is a direct result of his CRF and unfortunately, common for cats with his condition. The anemia has caused him to lose his appetite and become lethargic. The vet suggested we give Patrick a supplement called Pet-Tinic to help with the anemia. We can mix the liquid in with his food. We’ve been giving him the Pet-Tinic for a few days and it appears to be helping him, at least with a little extra energy. Until yesterday, he spent the last four days upstairs and didn’t come down for breakfast. We have been spoon-feeding him several times a day. He will not eat unless you put the food right in his face. We awoke to a surprise yesterday and found Patrick wasn’t in his bed. He was waiting for us downstairs in the kitchen, in his normal feeding area. Although he didn’t eat, it was good to see that he finally got himself out of bed and downstairs on his own. Now we just want to see him eat on his own again. Patrick went to the vet yesterday to get cleaned up. He was a little dirty and starting to smell bad. He just hasn't been able to clean himself in a while. Patrick is still having a problem using the litter pan, and has been leaving a mess everywhere he sits. Now that our buddy has been cleaned up, we need to wipe him a couple times a day to keep him clean. It's not a pretty sight, but I'd do anything for my Patrick. I hope this is making him more comfortable. A mobile vet stopped by this week, to check on Patrick. He has been doing better ever since. Patrick's appetite has increased and he didn’t sleep in the closet last night. WHISKAS® PURRFECTLY™ Fish and plain yogurt are his current favorites. It is still a little hard for him to walk. The stroke has taken away his balance. I hope that he’ll start getting some strength back in his hind legs. We have increased the sub-q fluids, so he’s getting it every 12 hours now. The vet is coming back out today for a second look. The biggest concern right now is that he hasn’t pooped in a few days. That is obviously painful and he is making unsuccessful attempts as using the litter pan. Overall, we’re very happy with the progress Patrick is making, although he still has a long way to go. While Patrick has been recuperating, Stanley and Gato have become closer. Gato can tell Patrick is sick, and she has been keeping watch over him. I just think Gato can tell that Patrick isn’t ready to cuddle full-time yet, so she’s picking up the slack with Stanley. They’ve been spending a lot of time together. Gato needs a cuddle-buddy. 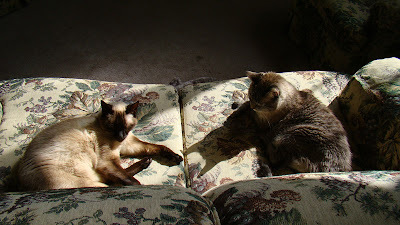 The kittens spent a lot of time in the sun today. Stanley sat by himself (like usual), while Patrick and Gato cuddled in the kitty bed. Patrick gave Gato a good grooming and cleared out her ears. He hasn't groomed himself in a while, so it was a welcome sight. 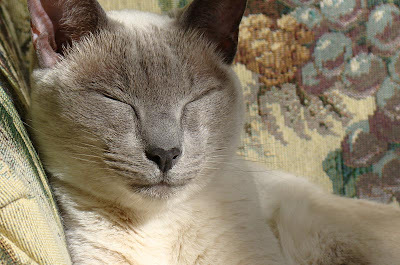 The meezers have different personalities, but one thing is certain, they all love their time in the sun. Patrick woke up early and appeared to have a good morning. I haven’t seen him eat that much breakfast in a while. Later we caught him napping with Gato. It felt wonderful to see them like that. Patrick came downstairs to nibble a couple times throughout the afternoon. I was impressed by the change, but it wouldn't last all day. We gave Patrick had his second dose of sub-q fluids today. Unfortunately, he did not handle it as well as I expected. He put up a bigger fight today and tried hard to escape the “burrito” towel wrap we used to restrain him. When it was over, Patrick just slumped to his side and didn’t stand right away. We helped him up and haven’t seen much of him. He’s been avoiding us ever since. I'm sorry Patrick, I hate doing this to you. 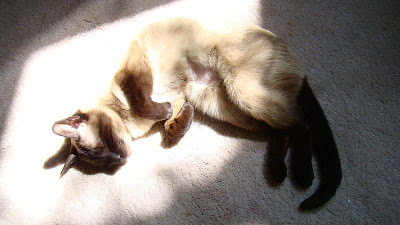 Stanley (AKA Lorna Doone AKA Mai Tai), a chocolate point siamese, is the newest addition to our family. 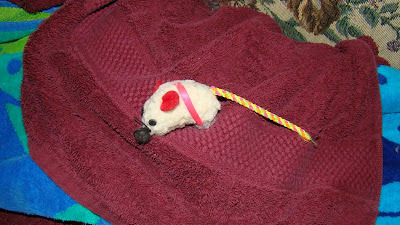 He came to us from Save-A-Pet in 2008, as a permanent foster. We're told Stanley is about 15 years old. He looks good for his age if that’s true. 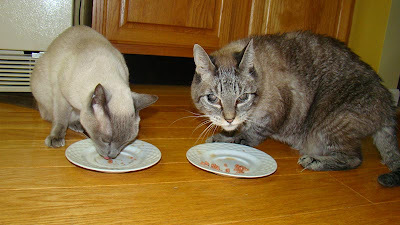 Stanley was an only cat, so he doesn’t always know the proper social etiquette around other cats. He is kind of a misfit and awkward. We’re actually Stanley’s third home. His original owner gave him up recently. I’m sure that was a terrible change for him. Another family adopted Stanley before us, but quickly returned because of “litter box issues”. We have found out about his little box issues, but we believe it’s medical related and we’re doing everything we can to help him. I couldn’t imagine sending him back to the shelter because of it. In addition to his litter box issues, he also has a habit of biting. This behavior seems to come out of nowhere, and is primarily directed at women. His ears will go back, and that’s your final warning that someone is about to get bit. We try to identify the early warning signs and defuse the situation, but he can be sneaky about it. I wish I knew what was triggering these outbursts. I know he really is a good cat and doesn’t want to hurt anyone. About a year after bringing Stanley home, we found out he has cancer. We already knew he was hyperthyroid. He's been put on several medications and sub-q fluids. It's contributing to his litter pan problems too. Overall, he seems to be doing well and he puts up a good fight when it's time for the fluids. He still has his strengh. I don't think he knows how sick he really is. 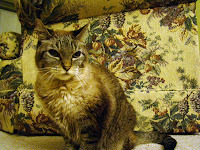 Patrick (AKA Buddy AKA Herrera) came to us from Texas Siamese Rescue in 2000. He was cat #793 on their list. I met Patrick on my first visit to volunteer at the shelter. He was actually staying in a small cage, in the back of a veterinarian’s office. There were about 40 cats in separate cages. This was the last stop for anti-social and aggressive cats. A “Caution” sticker was on his cage, as a warning to anyone that would consider sticking a finger between the bars. I spent a few minutes getting to know him while he sniffed my hand. Eventually I opened the door to his cage and stuck my head in. Patrick moved to the front of his cage, and then licked me on the nose. That would become one of his signature moves and to this day, I always enjoy when he comes up to give me a kiss. Within a couple weeks of working with the shelter, we adopted Patrick and took him home. That is when I realized why he had a Caution sticker on his cage. This cat hates pet carriers and traveling. I had to put on the thick leather gloves to protect myself from being scratched and bitten. That would become another one of his signature moves and to this day, he puts up a fight every time he has to travel. Patrick has experienced medical issues over the years. He was hyperthyroid a while back. We opted for the Radiocat treatment, instead of medication. Unfortunately, he was one of the 1%-2% with side effects, which caused high blood pressure. he is now on medication twice a day. 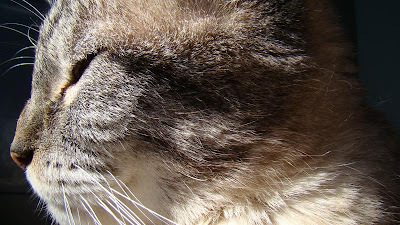 It’s hard for me to see him as he is today, an older cat that now has trouble walking and climbing. I’m just glad that we found him and he’s been with us for so long. He's our little sock mover, and I sure do love this old cat. He is a loyal friend and protector. Gato (AKA Supermercado Gato) came to our family in 1997, as a six week old, blue point Siamese kitten. From the start, she was a very dominant kitten and her personality has not changed. There's no question she's a Meezer! Over the years, we have spoiled Gato and she has no idea how rough the world can be. Unfortunately, some of our other cats have not been so lucky. Her roommates have come from various shelters in Texas and Illinois, most have sad stories to tell. Fortunately for them, the rest of their lives will be spent with us and their new sister Gato. We will do our best to give them all happy home. 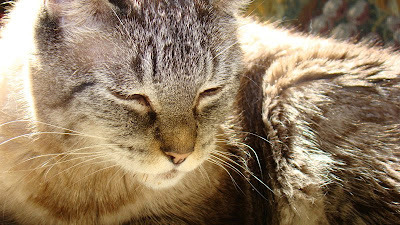 This blog is dedicated to Gato and all of the cats that have lived with us along the way.